When the weather allows I've been prepping the garden for planting. I like to do this a little bit at a time, an hour after work or a couple hours on the weekend. 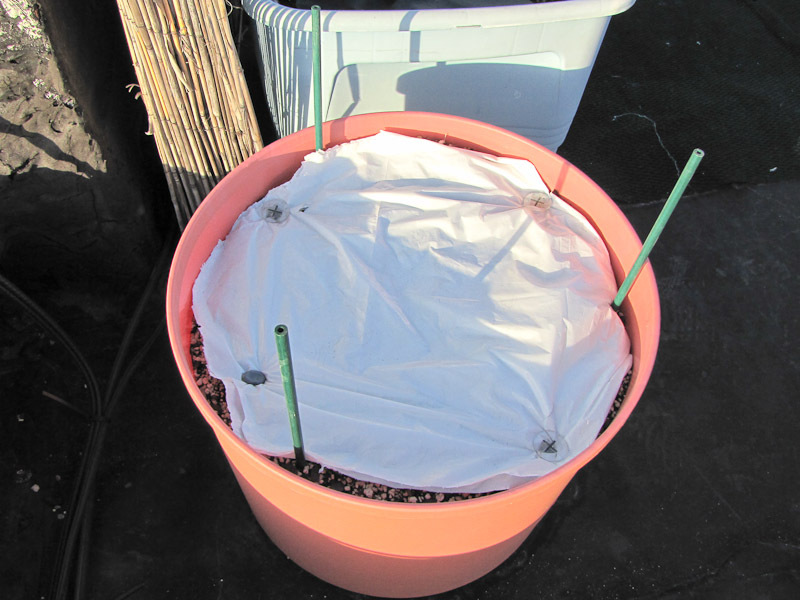 Adding soil to containers that look a little low, adding stakes/cages where needed, removing/replacing mulch, etc. are tasks done over a long period of time and completed days before the plants go out. Doing this beforehand means an enjoyable, stress free planting day. 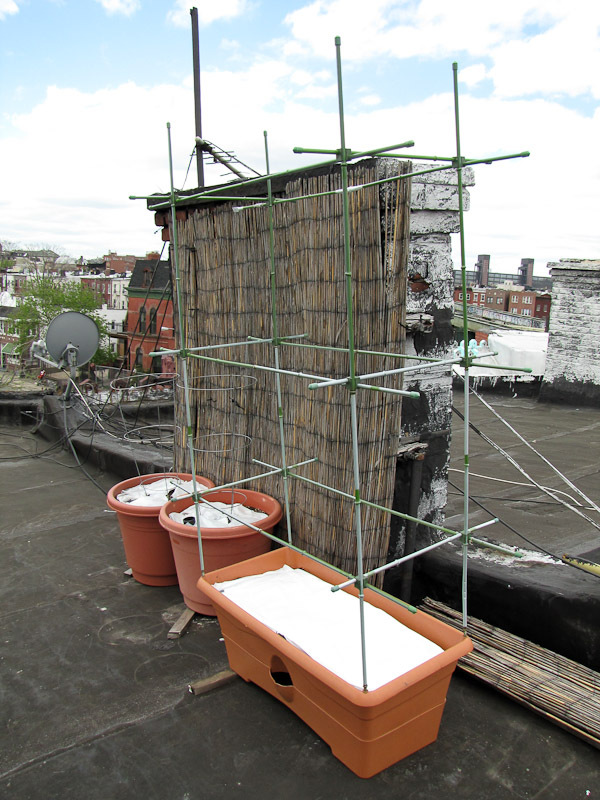 Practically everything needs support when growing on a rooftop. Tomatoes definitely need cages. Eggplants and peppers are fine with just stakes. Melons and cucumbers are vining plants that need netting/fencing or a trellis to climb. If I was gardening at ground level I would probably just let them sprawl, but that's not an option up here. 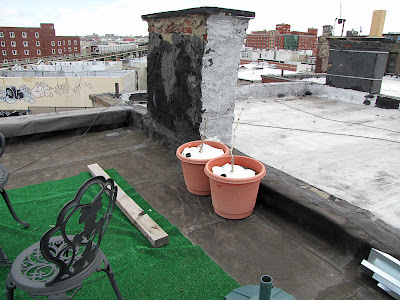 One reason is that the roof surface is black tar, it gets very hot in the summer. If I let the plants touch the surface the heat would cook the leaves. Another reason is the relentless wind. The constant, strong gusts would whip loose vines into shreds. I'm trying white plastic for mulch this year. Last year I used landscape fabric for mulch, but that material was too porous for the roof, water evaporated quickly. The year before that I used black plastic. Black plastic did a good job of holding moisture, but it also warmed up the soil. Warm soil helped when I had a tomato plant suffer from phosphorus deficiency, but by the time summer arrived I regretted its use. I hope white plastic will hold moisture as well as help keep the soil cool in the summer. In addition to buying soil to top off the existing containers, I bought more for the new self watering containers I added to the garden. So far I've added the Southern Patio Jumbo Growing Tower and my DIY self watering conversion of a standard planter. 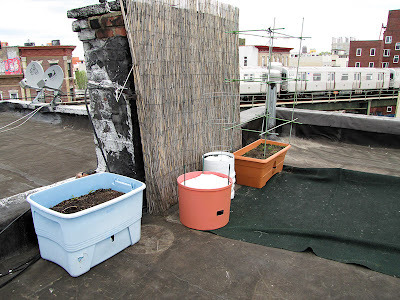 I also did some major decluttering earlier this year, so I have enough totes to add 2 more DIY containers to the roof. They haven't been built yet, I'll post photos of them once they're done. Is the white plastic just a garbage bag or some special type of plastic? It's great to see how your garden begins! Hi charmcity, nothing special, just white garbage bags. I like your staking system. I have to get a better system going this year for staking our tomatoes and cukes. They were a hot mess last year.